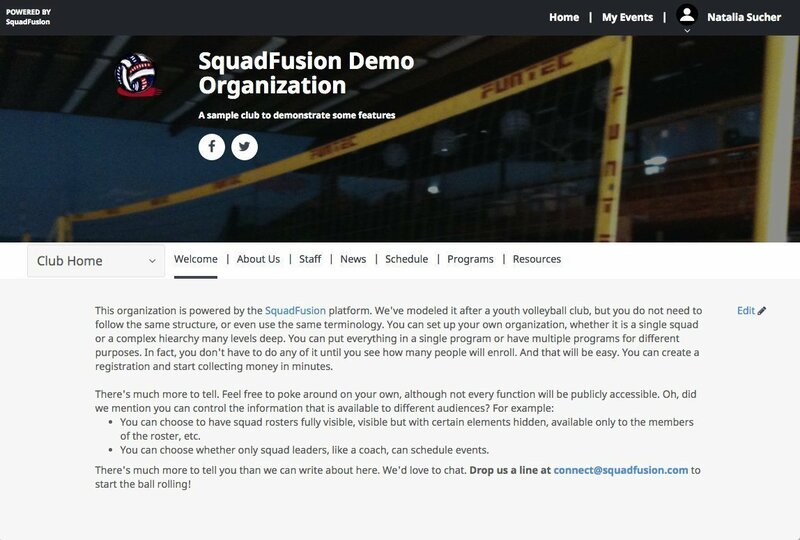 SquadFusion League Management Software create Easy 2 Use Websites. SquadFusion League Management Software Can Easily Create Websites. SquadFusion League Management Software websites are clean and modern. Sure, you can upload a background picture, but it won’t dominate what’s really important: your content. Websites shouldn’t try to cram so much on the page that it looks like a colorful tax form. We make it easy for your members and visitors to find information, and easy for you to keep things updated. With SquadFusion, you don’t need to be a webmaster to create a kickass website. We make it easy for you to control who sees what. You can differentiate between what everyone sees and what requires different credentials. That applies to the pages different people can see, and also the content they can see when they are on the page. SquadFusion websites are tailored to your organization. We use your terminology. Tell us once what you call something (athlete vs. player vs. participant vs. team member, etc. ), and we’ll reflect that everywhere, so you don’t have to worry about changing your website everywhere. We’re built for today’s world of multiple devices. Your site will work well on computers, tablets, and smartphones. Most of the content you create can be done inline, which means you add it or change it right where you want it. You can easily format text, add pictures, upload files for members to download, create links, and more. And you can create new events directly on the schedule page. Surface the most important and timely information. Designate key announcements to be emphasized on the main page, each user’s personal home page, and/or team pages. And you can set an announcement’s expiration ahead of time, so you don’t have to remember to clear it. After all, who wants to see last Saturday’s rainout announcement when it’s clear skies on Wednesday?